UNITED NATIONS, February 24 -- Three weeks after the UN told the Press that "it's not really for the Secretary-General to weigh in on this specific report" of the Intergovernmental Panel on Climate Change, Ban Ki-moon pointedly urged member states to "reject the last-ditch attempts by climate skeptics to derail negotiations by exaggerating shortcomings in the [IPCC] fourth assessment report." Some wondered, if the UN saw no need to respond three weeks ago but now belatedly steps into the ring, does this indicate the type of desperation exhibited by the UN's hastily put together press conference after Yvo de Boer announced his resignation? At Wednesday's UN noon briefing, three weeks after Inner City Press asked for comment on the IPCC's misuse of NGO press releases as science, it inquired into Ban's belated comment on the controversy, and his characterization of all who critique errors in the report as "climate skeptics." Inner City Press asked asked how Ban's upbeat read out on Copenhagen squared with his Timor L'este envoy Ameerah Haq's frank statement to the Press that Copenhagen was a disappointment, reiterated February 23 at the UN Security Council stakeout. "if you want to try to chip away between different people saying different things at different times, you could do that pretty much every day, and maybe you will... if you look at what might have been, had there not been the level of movement that there was in Copenhagen, then things would look even worse. Nobody has said that this is precisely what everybody wanted. Many people -- Yvo de Boer, Janos Pasztor -- who sat here right after the Copenhagen Conference with Bob Orr and spelled out what the role of the United Nations had been in getting to a good point, but that it was not good enough; that more needed to be done. So, it’s very easy to try to push a wedge between two different people." 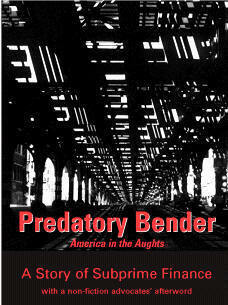 After this diatribe, several correspondents asked Inner City Press in essence, what is wrong with Nesirky? To compare two statements is basic journalism. And to report on now-acknowledged errors in an inter governmental body's scientific report is not necessarily "climate skepticism" -- it is journalism. The UN does not seem to understand this. Inner City Press asked, on February 3 and 24 and even before, for Ban's comments on IPCC chair Pachauri's refusal to make financial disclosure about income he receives from Deutsche Bank and others for advice related to his IPCC job. Nesirky responded that "To come back to the part of the question about business dealings and disclosure, this is something that he himself, Mr. Pachauri has spoken about himself, and I have no need to elaborate further on what he himself has said." That's leadership. The person more and more widely accused of lacking transparency has rejected the charges. What more could the head of the Organization need to say? Perhaps, as on Himalaya Gate, Mr. Ban will comment in three weeks. Watch this site. Footnote: beyond her refreshingly candid comments on Copenhagen as disappointment, Ms. Haq also answered Inner City Press' questions about an incident in which UN Police in Timor L'este were filmed standing by at Timor L'este police beat up a protester. She said it is under investigation, and that UNPOL has a duty to report. But don't they also have a duty to protect civilians? We'll see. UNITED NATIONS, February 3 -- With various ice research related scandals opening up around UN Secretary General Ban Ki-moon's signature issue of climate change, Inner City Press on Wednesday asked his spokesman Martin Nesirky for Ban's views on the misleading of the public about the melting of Himalayan glaciers. Spokesperson Nesirky: Last question, Matthew. Inner City Press: There has been a lot of controversy around the finding of the IPCC (Intergovernmental Panel on Climate Change) about the Himalayan glaciers, and they have essentially back-tracked and said that they apologized; it was unverified information. Mr. Pachauri has said he won’t apologize. But, I wonder what, given the importance of climate change and the IPCC to the Secretary-General’s agenda, what does he make of this controversy and how can the IPCC process be reformed to not create this kind of controversy on the issue? Spokesperson: The Secretary-General is obviously aware of these reports and what’s been happening in the last few days and weeks. But, you know, ultimately it’s for the IPCC to address this. It’s for the IPCC to talk about this, and they have talked about this in some detail. They have said that they regret what happened, and reaffirming their strong commitment to a high level of performance in their reporting and so on. So, therefore, it’s not really for the Secretary-General to weigh in on this specific report. There are many reports, there are many other aspects to the work on climate change, which is absolutely vital, as you’ve mentioned; it’s one of his priorities. So, I think that the most important thing is to focus on the road to Mexico and how you can improve the prospects for that meeting and what needs to be done between now and then. Inner City Press: [inaudible] because… in the last 24 hours… Mr. Pachauri…. Spokesperson: IPCC regrets, Matthew, IPCC regrets. 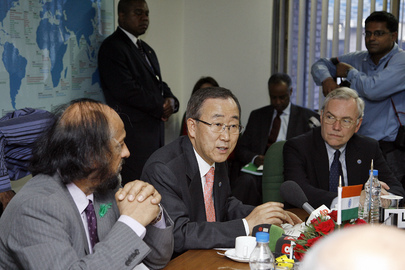 Spokesperson: No, no, Matthew, the Secretary-General does not rest his case purely on the IPCC. There is an enormous body of evidence and information out there from various different sources, not just from the IPCC, however important that may be. And an error in one report does not undermine the entire science that is clearly proven. 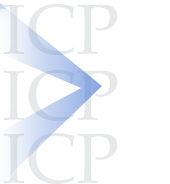 So who apologized -- the IPCC's website? 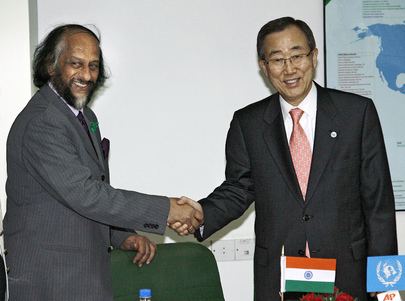 To have nothing to say about the various scandals surrounding the IPCC and Pachauri seems strange. It's why some say Ban is now shifted to rolling the dice on a trip to North Korea -- our next story, forthcoming. 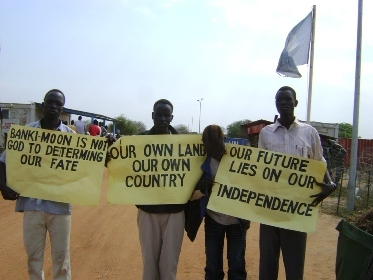 UNITED NATIONS, February 2 -- Following a protest of the UN in Juba, South Sudan which included calls for "Ban Ki-moon [to] repent before judgment," the UN belated rushed to argue that Mr. Ban was misquoted by AFP about disfavoring a vote for self-determination by the South Sudanese. Ban's Associate Spokesman Farhan Haq came in late for Tuesday noon briefing at the UN in New York, read a statement then began to leave the podium without taking any questions. 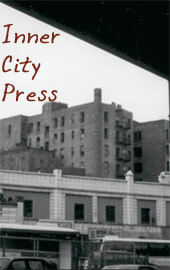 Inner City Press called out, will you take questions later? When he did, later, the UN did not transcribe it. But Inner City Press asked Haq both what the UN says Ban told AFP, and how Ban's statement about making unity attractive does not indicate a preference. Haq argued that this language is from the CPA. He said he would later provide Ban's actually words to those interested. Video here, from Minute 1:50. When Inner City Press went to Haq's office before six p.m. on Tuesday, it was closed. The Deputy Spokesperson handed Inner City Press a print out in which AFP had dutifully modified the quote. This was taken at face value. But also in Haq's begrudging Q &A period, when Inner City Press asked about UN vehicles stolen in Darfur, Haq answered that this would not undermine the UN's "relationship" with "military leaders of Sudan." Video here, from Minute 3:33. Ban Ki-moon, whether due to personal beliefs or by letting others in his administration take the lead, has elsewhere come down firmly on the side of central governments over minorities seeking autonomy. During the Sri Lankan bloodbath on the beach of 2009, for example, he and his closest advisors were seen as doing little to stop the Rajapaksa regime in Colombo from bombing civilians in norther Sri Lanka, to crush "separatism." This is not irrelevant from consideration of Ban Ki-moon's statements and attitudes about Sudan. You can make AFP run a correction, then dodge and not transcribe questions, but the issue remains and will be pursued. Watch this site.